Put your discount shoes on, because we’re going for a savings dance. Football Manager 2013 was officially announced yesterday, but our partners at Green Man Gaming have wasted no time in slapping a hefty 25% discount on the new Sports Interactive title, taking it from £39.99 down to £29.99. 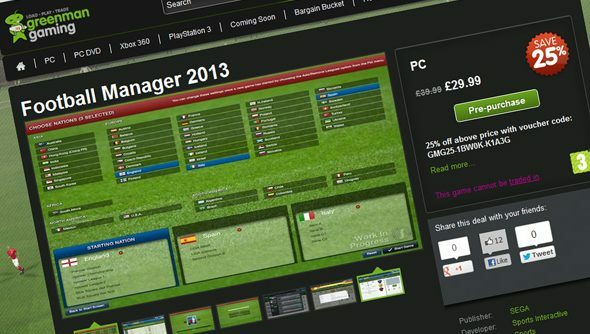 Crazier still, head to the Football Manager 2013 store page now and you’ll find a second 25% discount in the form of a voucher code. This two-punch discount combo brings the final price down to £22.50. That’s a 44% discount overall. Maths fans. Here’s Miles talking us through some of the 900-odd new features in FM13.